#1 Fairy Tales and Fables. In very good vintage condition; it is a little dirty. 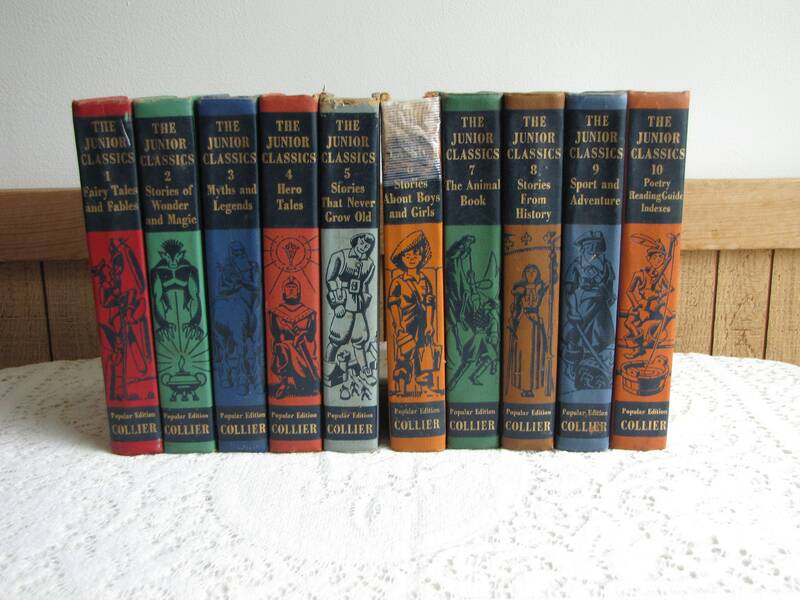 The book is broken down in country categories of: England, Ireland, Germany, Norway, France, Czechoslovakia, Russia, and Fables from AESOP to include Three Little Pigs, Jack and the Beanstalk, History of Thom Thumb and Hansel and Gretel. #2 Stories of Wonder and Magic. In good vintage condition; dog eared on the lower right-hand corner on the back board. Some stains and a little dirty. 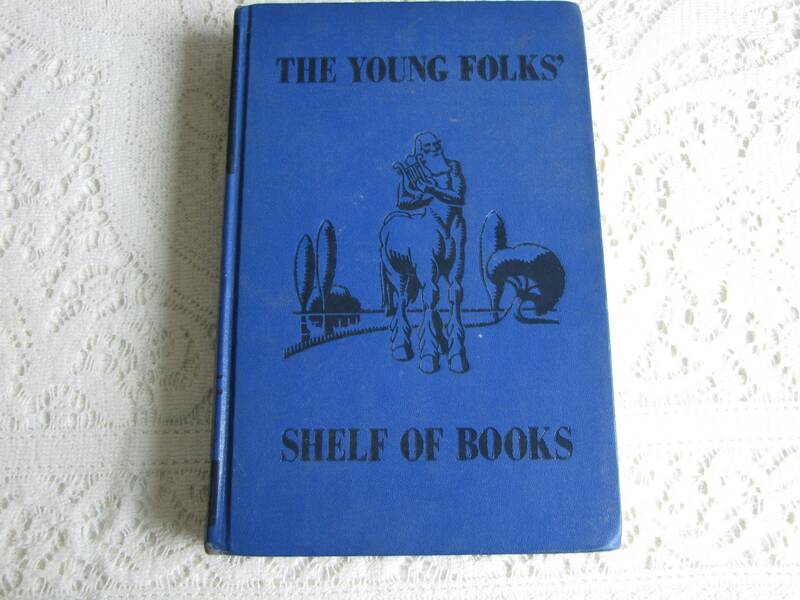 The book’s categories are Fun and Nonsense (Uncle Remus), From Old Story Books, (The Light Princess), Dreams and Enchantments (Aladdin), Stories by Howard Pyle and Frank R. Stockton (How Boots Befooled the King), and Stories by Hans Christian Anderson (The Princess and the Pea). #3 Myths and Legends. In very good vintage condition; no real issues. 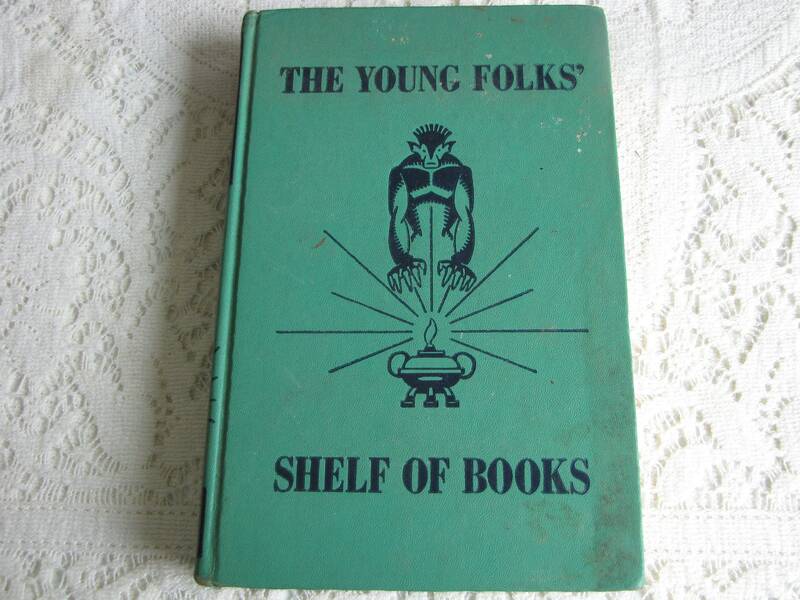 The book is broken down into the following categories: Stories from the Myths of Greece and France (The Argonauts), Stories from the Norse Myths (How All-Father Odin Became Wise), Stories from the Jataka Tales of India (The Banyan Deer), Stories of the American Indian (The Coyote and the Fox) and Old Legends (William Tell). #4 Hero Tales. In very good vintage condition; no real issues. Categories are The Odysseus of Homer (The Adventures of Odysseus), The Epic of Kings (Rustem and Sohrab), The Kalevala (The Forging of the Sampo), The Song of Roland (Roland and Oliver), The Chronicle of the CID (The Chronicles of CID), Beowulf (Beowulf Fights the Dragon), King Arthur (Knights of the Round Table), the Mabinogion (The Hunting of the Boar), Celtic Heroes (Finn and Oisin) and Robin Hood (Robin Hood and Little John). 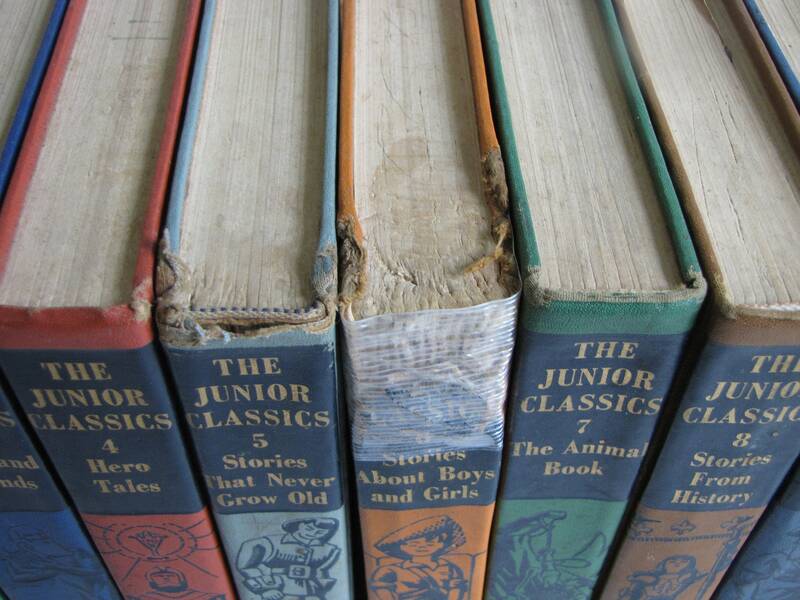 #5 Stories that Never Grow Old. The book is a little dirty and there is a dog-eared corner on the back board on left hand corner that goes around the top of the spine. 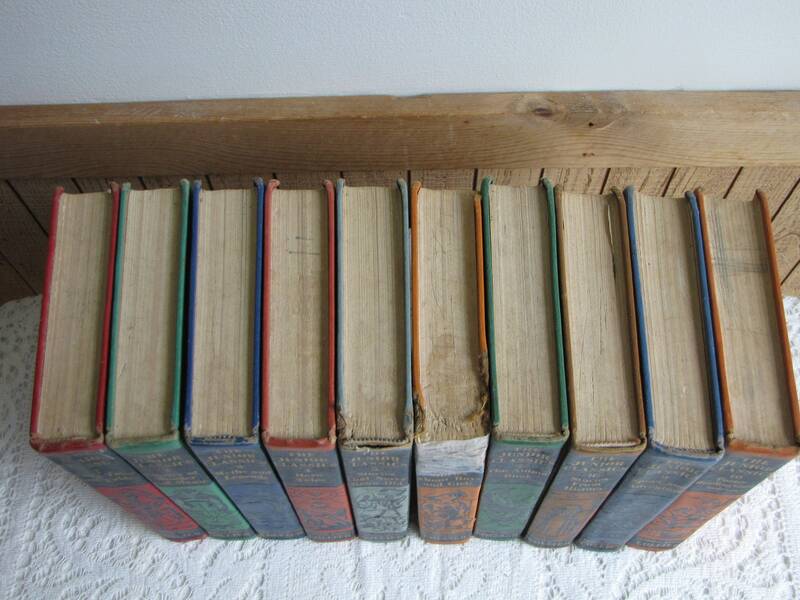 In good vintage condition with some crayon marks on the opening blank page. 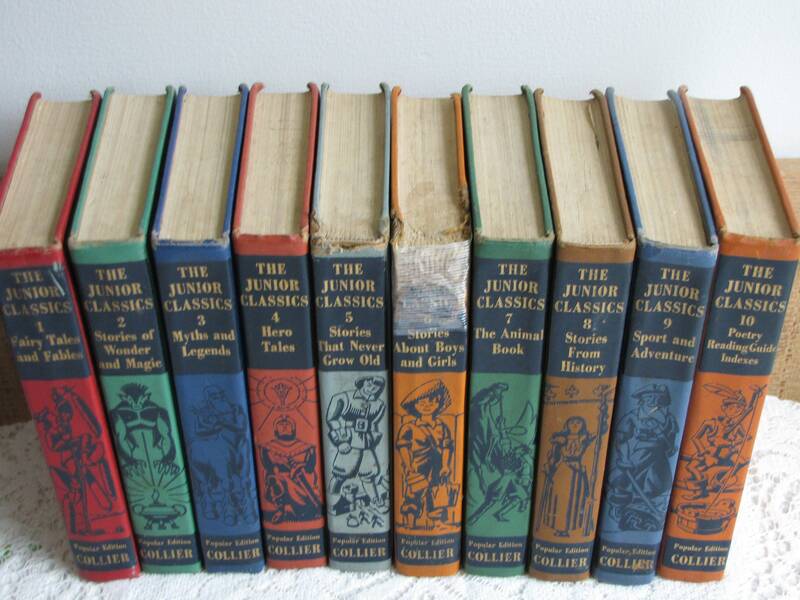 The stories include Alice in Wonderland, A Midsummer Night’s Dream, Gulliver’s Voyage to Lilliput, and Rip Van Winkle. #6 Stories about Boys and Girls. 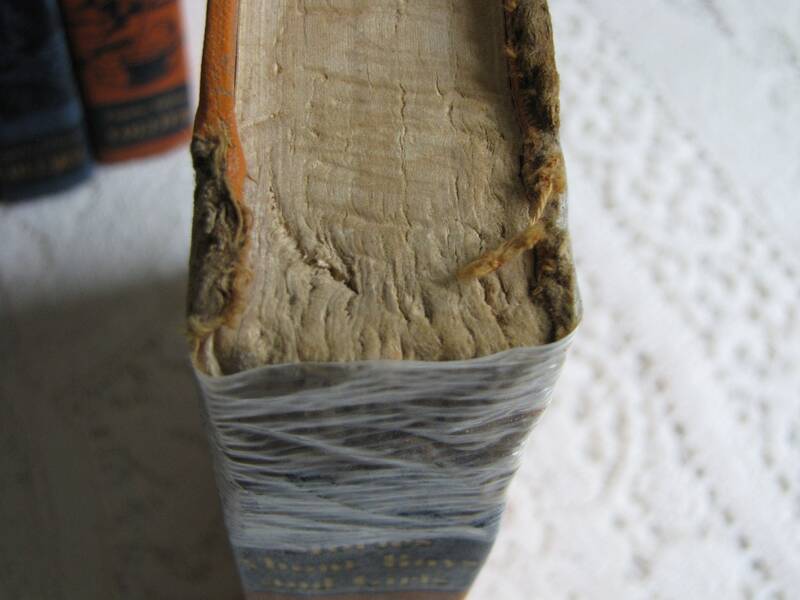 This book is the worse of the lot in regards to condition. 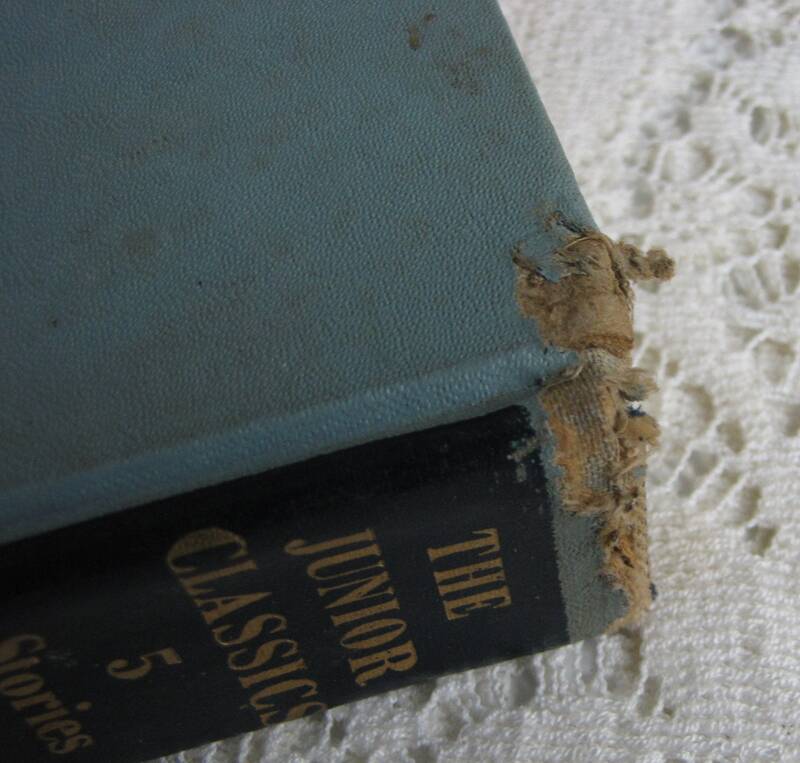 It has been chewed on and has a strip of tape on the top to hold the top binding and it is dirty. Literally dog-earred. Authors include Louisa May Alcott (Nelly’s Hospital), When Eliza Orne White (When Molly was Six), Mark Twain (Tom Sawyer Whitewashes the Fence, and Richard Harding Davis (Gallegher). #7 The Animal Book. It’s a little dirty, otherwise in good vintage condition. 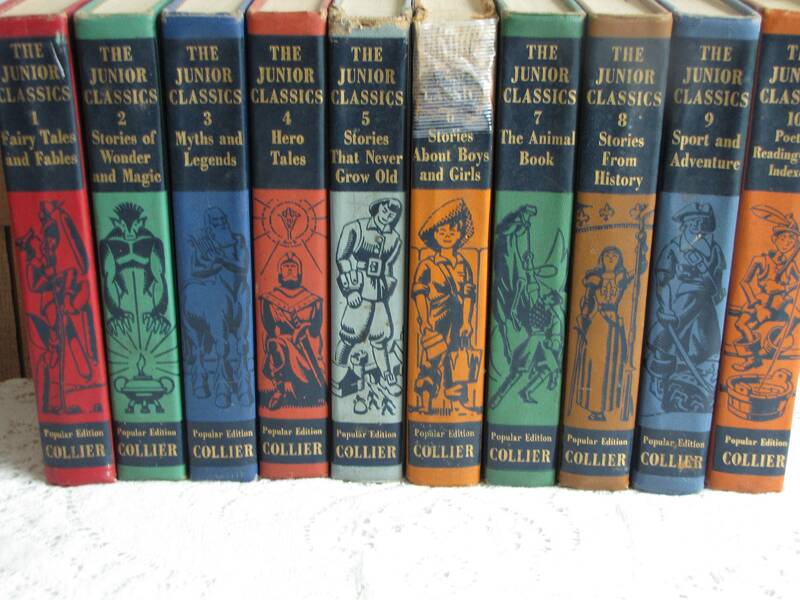 There are two categories: True Adventures (Buster and Zinnia and Her Babies by Margery Bianco, My Friend Toto by Cherry Kearton, and A Cowboy and His Pony by Will James) and Stories About Animals (Black Beauty, Anna Sewell, Gulliver the Great by Walter A. Dyer, Lassie Come Home by Eric Knight). #8 Stories from History. A little dirty, otherwise in very good vintage condition. Stories include The Story of Molly Pitcher, Daniel Boone’s Rifle, Davy Crockett Legends, and Louisa Alcott, War Nurse). #9 Sports and Adventures. A little dirty, otherwise in very good vintage condition; the title page inside is town in the upper right-hand side. 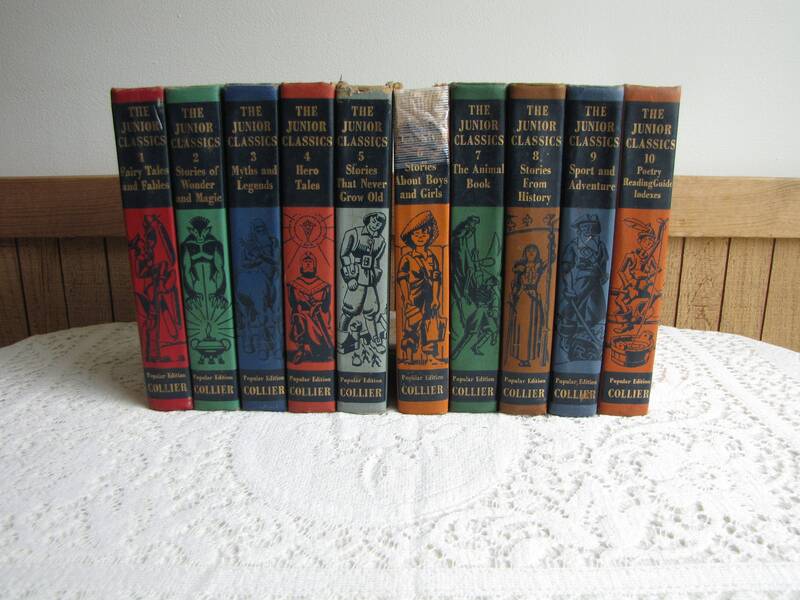 Stories are by authors, Jack London, Charles A. Lindbergh, A. Conan Doyle, and Richard E. Byrd. #10 Poetry and Reading Guide Indexes. Some pencil scribbling on the beginning title pages and a little dirty. In very good vintage condition. Stories include nursery rhymes, riddles, poems from childhood and youth, the world of creatures, fairyland, at home and at play, and old ballads and stories. Authors include William Blake, William Wordsworth, Emily Dickinson, Robert Louis Stevens, Robert Frost, and Carl Sandburg.